The poster makes this movie look so much better than it is. 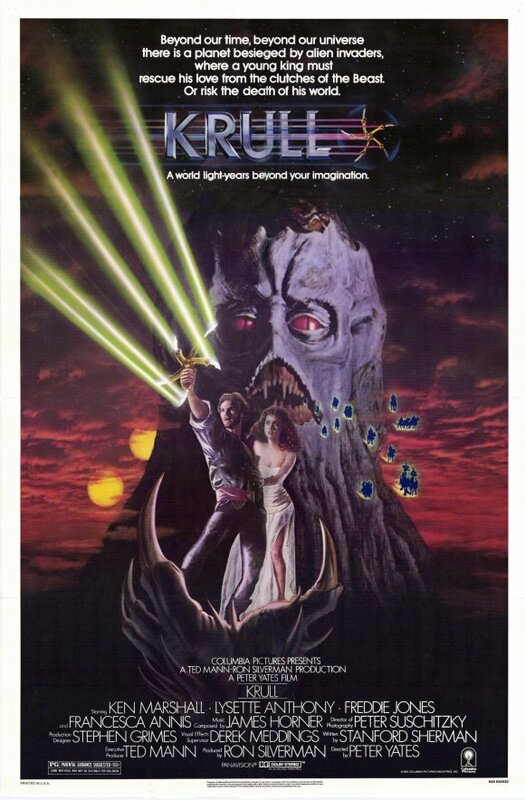 Even by the standards 80s genre movies, Krull is one of the most derivative pieces of garbage that I’ve ever had the misfortune of seeing. On the surface, the movie is little more than a pastiche of tired fantasy tropes. Arguably, this movie might seem less offensive and more original in a world where Peter Jackson didn’t bring the Lord of the Rings trilogy to the big screen. Though I have to assume that even in the early 80s, with nothing other than the crudely rotoscoped Lord of the Rings movies in play, enough people had read Tolkien’s books to realize just how shamelessly Krull appropriates the ideas of its betters. Seriously, Adam, we’re not going to read all of this review if you’re not going to do anything other than pick on a 30 year old movie. Fair enough. Let me come to the point of this review. 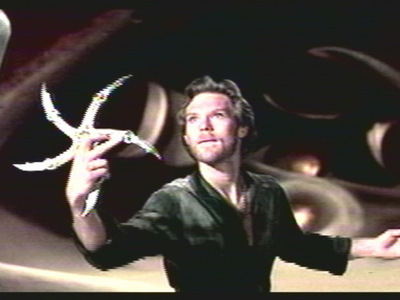 Despite the bad acting, worse writing, and even more terrible special effects, which make the Master Control Program spinning God that shows up in The Ten Commandments look state of the art, there is something of critical value within the five pointed turd that is Krull. For those keeping score at home, I did just compare a cinematic interpretation of Yayweh to the bad guy from Tron. Returning to the point at hand, Krull offers viewers one interesting take away message. That’s not to say it’s a particularly deep subtext, but it’s something that seems to have persisted within popular culture. From start to finish Krull is a not-so-subtle metaphor for the culture battle between fantasy and science fiction, and an odd forecast of the ultimate triumph of the former over the latter. Krull’s antagonist is an alien called “The Beast”. He arrives on planet Krull, a world of magic, feuding human kingdoms, Cyclopes, and giant spiders, in a space ship locally known as The Black Fortress. Fearing some sort of prophecy (why is there always a prophecy?) the Beast busts up a wedding that would have united the two dominant human kingdoms of Krull. The Beast’s Slayers then kidnap the princess leaving the prince to find a magic weapon called “The Glaive” and rescue his lady love. In doing so the boy becomes a man, he meets some cannon fodder friends, he has some adventures, and ultimately kills the bad guy through the power of magic and…love. Yeah, love is the ultimate power that allows Prince Packing Paper and Princess Mostly-A-Prop to destroy the Beast. Setting aside the fact the big bad’s hired goons ride (terribly) on horseback, for what were obviously budgetary reasons, The Beast and his Slayers are actually interesting science fiction creations. The Beast himself appears ancient, enigmatic, and able to take on any form that pleases him. He cares not for humans, save for the prophecy that says they will come to dominate the galaxy. Subject to the limits of 80s theatrical productions, the interior of the Black Fortress hints at a geometry that is beyond our three dimensional understanding of reality. In short, The Beast could quite easily fit into the canon of Elder Old Ones as envisioned by H.P. Lovecraft. The Slayers are perhaps even more interesting. 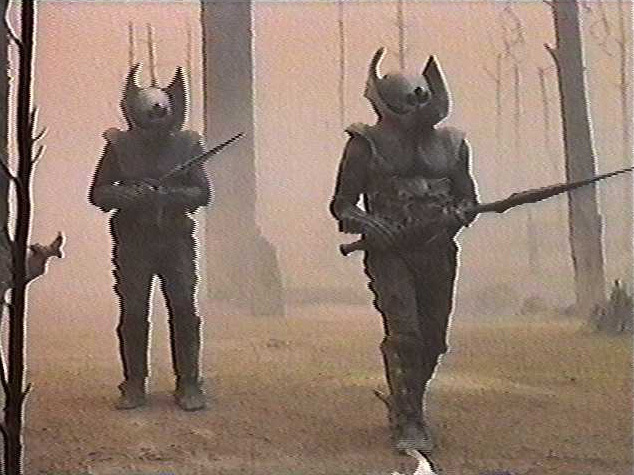 Armed with laser-swords, that is to say a weapon which offers a metal blade on one end and a directed energy weapon on the other, the Slayers look like the generic sort of storm trooper rip off that was ubiquitous among the drek of the late 70s and early 80s. It’s only when a Slayer is killed that they become unique. Upon a Slayer’s death, a slimy alien crawls out of the deceased’s helmet and burrows into the ground. So perhaps the Slayers are humanoids controlled by parasites. Maybe they are aliens piloting mechanical bodies. 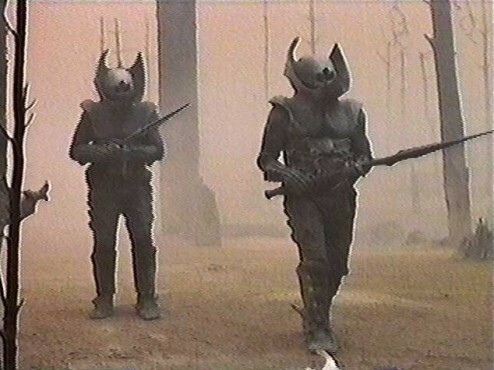 Being the nerd that I am, the Slayers reminded me of the Radamians from Tekkaman Blade: plant based alien parasites that convert suitable life forms into armoured foot soldiers. Despite the obviously superior technology that the Slayers possess, never once does a member of Prince Packing Paper’s band trade in their sword and shield for a Slayer’s laser blade. To do so would offer a tacit admission that the ways of technology are better than those of fantasy. The movie’s third act further supports this supposition. Since the Black Fortress teleports to a random location each day, the heroes search out…magic flying horses (yeah, I know, I’m sure it hurts you to read it as much as it hurt me to write it) to confront their foe. During the final battle, the Prince uses the Glaive to wound the Beast. However, it is only pure love powered magic that ultimately fells the extra terrestrial foe. The message is quite clear: magic always beats technology and consequently fantasy trumps science fiction. What really galls me is that within Hollywood’s expectations of what people want, Krull gets it right. Even though Krull’s sub-textual bludgeoning makes it very obvious that science fiction and fantasy are opposite sides of the same coin, the thirty years that have followed this movie demonstrate a far greater dedication to fantasy than science fiction within cinema. Not to be labour the point, because I really do like his movies, but consider that Lord of the Rings gets the Peter Jackson treatment while the most recent Dune adaptation was a low budget Sci-Fi Channel affair. Still not convinced? Ask yourself this, when a fantasy movie flops is the damage ever spoken about in terms that extend beyond the film in question? When a sci-fi movie pulls a Prometheus it’s something that spurs conversation about the future of the genre. Don’t believe me? I dare you to read this and tell me it’s the first time you’ve heard a conversation along these lines. Somehow one bad science fiction story has the power to invoke doubts about the prospect of science fiction as a genre so much so that studios are only willing to invest in proven properties. Drop a stinker of a fantasy movie, and life moves on without questioning the foundation upon which fantasy stories are told. While Krull might offer little in the way of entertainment value, it’s marginal worth can be found in an ability to foreshadow the entertainment tastes of a generation. If that’s not enough motivation for enduring this ninety minute bowel movement, Liam Neeson is in it. I guess Battleship is less the exception and more the rule when it comes to Liam Neeson’s recent penchant for questionable movies. After rolling on the floor reading this article, somehow you have inspired me to watch this 90 minutes of nails on chalkboards and laugh delitedly. Well done. Make sure to watch it with a friend so someone can hear MST3K worthy snark it will evoke.